Eureka by name and Eureka by nature – Eureka Safety are redefining vibration reducing gloves. To achieve this benefit requires crude and potentially risky matching between the tool type and the design of the protective padding in the glove, with the worst glove-tool combination actually doing more harm than good! We chatted to Markus Berger from Eureka Safety about the importance of correctly selected and used vibration reducing gloves. Hi Markus – thanks for taking the time to chat about this important topic. Let’s get straight to it with a question that’s on everyone’s lips: when it comes to vibration reducing gloves, do the fingers respond differently to the palms? Absolutely! The fingers all react differently from the palm, and in fact a good EN10819 certified anti-vibration glove can actually still be harmful for your fingers. The vibration data, also called acceleration data, given on most machines is based on ISO 5349-1. It’s a good estimation of wrist and palm injuries, but it underestimates White Finger Syndrome for impacting tools and faster machines of 100Hz / 6000rpm and above. As you’ll see from the above graph – where the risk exposure for wrist and palm is indicated in blue and finger risk is plotted in orange – to reap the benefits of vibration reducing gloves the finger response must be taken into account. I see! So is the response the same to each tool? Good question. No – no vibration glove will protect the entire hand from every tool and type of vibration, or frequency, since each part of the glove will respond differently to different tools! The protection is dependent on the rpm of your motor and total frequency spectrum of your machine. The only way is to secure a crude matching between the vibration glove design and the frequency of the tool – as is shown in the Tool Type table. What are the limits of traditional AV gloves? 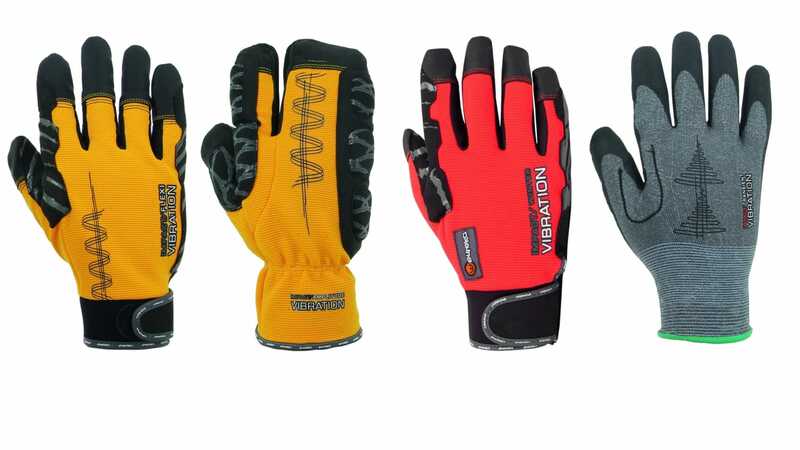 Most certified vibration gloves provide good protection above 50-100Hz for palm and 500Hz for the fingers, but they also amplify hand-arm vibrations around 30Hz and finger vibrations from 100-300Hz. What are Eureka Safety’s four vibration glove solutions to the four machine segments? Firstly, there are impacting tools such as rivet guns, impact wrenches and jackhammers. 15-1 Transient vibration is a relatively thin, soft glove, cleverly designed to maximise protection with very thin padding. The high dexterity allows it to be used in areas where no vibration glove has been used before. These gloves are not well suited for rotating tools, however, as they will increase damage to fingers if used with these types of tools. Next, we move on to impacting or fast rotating tools such as Fein machines, high speed grinders and work with lots of vibrations caused by working the subject such as cutting a metal pipe. The Impact Vibration and the corresponding Impact Vibration winter glove is a balanced allround approach for faster machines. Keep in mind that these gloves are not well suited for slower tools as they will increase damage to fingers. Rotating tools such as angle grinders, sanders and similar are an extremely demanding segment where only our patent pending Amplitude gloves offer full protection, which comes at the price of lower finger dexterity. These products cannot pass AV glove certification EN 10819 as they are too thick. Finally, hand protection for use with slow rotating tools, circular and jigsaws, brush cutters, lawn mowers and slow polishing machines. Construction workers as well as green sector workers frequently operate slow rotating tools and require good dexterity at the same time! Fortunately, this combination is doable, but without protection at the upper parts of the fingers. These products cannot pass AV glove certification EN 10819 as they lack padding on finger tips. It should also be noted that any padding on the finger tips would be counterproductive and dangerous when working with slow rotating tools. Wow – it really is imperative that you select the right glove for the right job! Exactly. As you can see, all our gloves are designed to cater for and protect against very specific hazards. You can’t try to be a jack of all trades in the gloves game! Each application demands such different requirements from its protection that there’s no one glove that will offer optimum protection against all hazards. We’ve tailored our products so that workers can be sure – provided they’re using the right glove for the right job – that they are as safe as possible. All we want is people to get home safely at the end of each day!